From Robert Mazur in the New York Times, in the context of the puny punishment given to HSBC, caught red handed laundering huge sums for murderous Mexican drugs cartels. He was a federal agent for 27 years and worked undercover as a money launderer within this murky realm for five of them, and worked on teams that put leaders of drug cartels behind bars. "The only way to stop the flow of this dirty money is to get tough on the bankers who help mask and transfer it around the world. Banks themselves don’t launder money, after all; people do." 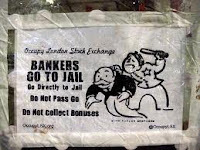 "Senior HSBC bankers need to face jail for their bank’s role in laundering drugs money; fining the bank won’t work." It is the power of the finance lobby that is preventing this much-needed step from being widely used. And some banks, as the HSBC case shows, have become Too Big To Jail. This will be added to our intermediaries web page.